There's a rarely asked question in Sino-African scholarship. This is a bilateral relationship that really prompts it: Is so much business interest in Africa a mistake? Loan defaults and expropriation can be the end result of an investment and lending wave by China that has saved the economy. And this is despite how enormous the political goodwill is in this relationship. After all who armed Mugabe while he was fighting the Rhodesians. Yet somehow this looks like a big disaster with few dividends. Granted favored countries to lend and invest in like Ghana and Zambia are in no way Zimbabwe but most African countries have bad investment environments or future macroeconomic situations. Part of the explanation for why China-Africa is at such an advanced stage is not grounded in good reasons (from China's point of view) and may well be that pursuing it at this scale was a costly mistake. Yes, but the countries with good investment environments that have also attracted a lot of lending on top of investment will have bad macroeconomic situations (Ghana and Zambia). And there is now over the last 16 years 100 billion dollars in lending, most of the loans are outstanding. I have a bad feeling that future FOCAC summits will be dominated by large groups of countries demanding concessions on repayment of those loans so these trouble spots will go beyond a few countries and gather into a continent sized force. This relationship will not look very win-win in such circumstances. Africa Wins, China Loses. Being a citizen of Zimbabwe myself, I have recently noticed a number of Chinese would-be investors visiting to inquire on the country's indigenisation regulations. However, in the past this was not the case since the government clearly gave the idea that the Chinese were exempt from the regulations of this policy. 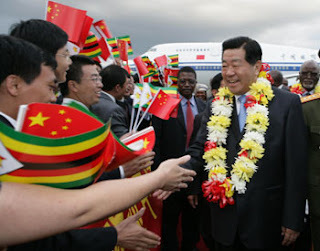 Please read the following https://www.newsday.co.zw/2011/03/02/2011-03-02-kasukuwere-exempts-chinese-from-indigenisation/. Even today, it is not very clear whether Chinese investors are fully complying or are given favourable treatment of some sort. The government of Zimbabwe itself has not been very clear as well on whether Chinese investors are treated the same as Western or South African investors under this law. So I think it is very difficult to come to a conclusive position regarding this issue. Thanks Ronald for your comment -- the link you provide only gives the example of Tian Ze, which (as I note above) has long been known to have been exempted from the indigenization decree. This is also what I was told when I inquired about this around the Chinese investor community. Most were very uneasy about how this was going to unfold.